One of the biggest Aha moments I have ever had on my internet marketing journey was the power of email lists..
One of the biggest Aha moments I have ever had on my internet marketing journey was the power of email lists. I was actually building a list for at least 3 years before I had that “NOW I GET IT!” realization. In fact I had been building a subscriber list for my recruitment company and quite a sizable one too, well into double figures! It wasn't until I started creating products and had built a modest list of around 1000 subscribers from my very first product (WordPress SEO Blueprint) and sent an email promoting an offer from Andy Fletcher that earned me money that it finally sunk in. I remember that day well, because I had just earned $440 on the first day and I was shocked lol. Your email list doesn't have to be huge to make decent money, what is needed is engagement, a sensible approach, trust and “perceived” authority. That day when I made $440.00 promoting a software that had been released months before was an eye opener for me and I knew right at that moment that I had stumbled accidentally into the easiest gig of my life! As I grew into my accidental discovery and started to get comfortable (who wouldn't!) with the “5 minute email that brings in hundreds of dollars” reality I started to learn more naturally about email marketing. How do I get more traffic!... How do I build a bigger list faster? Using services like aweber and getresponse are safe ways to manage and grow your lists but over time as the list gets larger the monthly recurring fees really do run into hundreds of dollars per month. The problem is that the list is a major asset by that time, you understand the value of it and it's kinda scary to move away from a safe service like aweber and use something new. Who Is It For? Who Is It Not For? Now you're probably wondering if this is for you right? In fact it's the one question we all have in common when we are presented with an offer, or to be more specific the real question we all have is.. This is not for you if you do not fit into at least one of the above scenarios. If you do however, then you are either making money with email marketing or you have done the one thing needed to start making money from email marketing. Made The Decision To Make It Happen!...Really that's ALL it is. To make money from email marketing by building a list is simply down to making the decision to do so and having the will, the intense desire to make it happen and to take actionable steps to do it. Honestly, if you have that and you have “certainty” that you will follow through and make it happen then CONGRATULATIONS, you're well on your way. So let's take a deeper look at the product itself. SENDEngine is kinda similar to other tools that we have seen in recent launches over the past year or two, in fact when I spoke to Radu and Petru (the product creators) I did ask about one of Radu’s previous products which was “MailX”, a hugely popular product and recently recommended to me to use from other marketers who love it. I asked Radu about a comment he had made on his JV page about SENDEngine being 10x more powerful than MailX. So of course I took up the offer for a review copy and got to work on it right away and I'm happy that I did, It's so easy that even I could set up without one of my assistants coming to my techie rescue. I did have one or two questions and they got responded to immediately but there are step by step screenshots and they are very easy to follow. It's “LOW” launch special one time cost and that's why I am recommending it. It works with Sendgrid, Mailgun and Amazon SES which are low cost for sending email and you get charged pennies per 1000+ email sent, believe me it works out far cheaper than aweber and getresponse! I already had a mailgun account but created a Sendgrid account too which took about a minute to do. You can create forms and build your list with SendEngine whereas in mailx that feature is not available. Of course I can't comment yet open the open rates, but this will be tested extensively over the next few weeks but as we are using services that are proven to have great open rates like Sendgrid then we should be comfortable in the knowledge that thousands of marketers swear by these services over the big companies like aweber etc. What I Don’t Like is just the feeling of unfamiliar territory, but that's not a fault of the product itself, it's about me getting out of my expensive aweber comfort zone, but of course I do not have to close my aweber account lol. 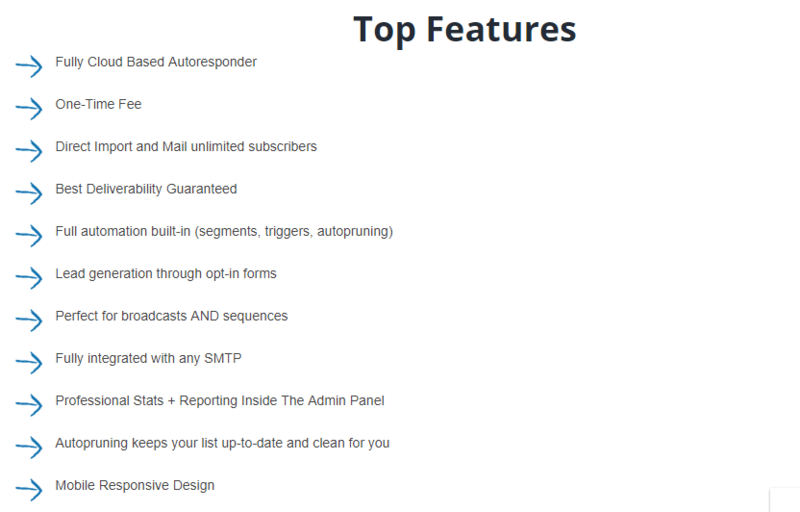 Think about that, a multi featured autoresponder system costing just over 20 bucks that can and will save you thousands of dollars per year. It hard to fathom the pricing on the Jvzoo launches sometimes but you know why they sell low? Not much profit in a twenty bucks product on the launch, but we are talking high volume sales on launches and thousands of new subscribers on the email list that should earn the guys thousands of dollars extra revenue month after month. The money is in the list, if you still haven’t yet started list building then do it, it can be done in any niche. Now the good news is that we pick up again tomorrow with Project 66 and we will have a complete 14 day step by step finished by the end of the week and on the blog and you will have free access to all 14 days training. There is about 10 days there right now but we will go back around and refine the steps and finish off till day 14. If you are a Project 66 premium member remember then to connect with tanya for your free one on one session with me, we have done a few already and the guys are happy who have had that time with me on a call. Check out the Sales Page for SENDEngine, it's a great investment, it's one that will pay you over and over again. Think of offering email marketing services to businesses or authors, or people who have non I.M niche blogs, they will have lists and no idea what to do to monetize them, that's a major opportunity. I will do a blog post on my experience about that sometime soon, and tell you the story of the lady with a 90,000 + list from her blog about how to deal with depression...long story! Get SENDEngine Here For JUST $22.00!